In January, the Washington National Opera (WNO) held its eighth annual festival of contemporary opera, the American Opera Initiative (AOI). Conceived by WNO Artistic Director Francesca Zambello and former WNO Director of Artistic Operations Christina Scheppelmann as a way to nurture and grow the production of new opera, the program itself has grown, with some of the created works continuing as full-scale opera productions. Each year, AOI productions involve three short operas and one longer opera, each based on a theme or a story that is American in some way. They are scored for a small chamber orchestra (usually 13 players), in part because they play in one of the Kennedy Center’s smallest venues, the Terrace Theater. The short form was chosen to give participants the chance to create a story, characters, and drama without the pressure of a whole evening. Composers and librettists chosen for the longer works are more established in the field. An important feature of the program is mentoring by well-established conductors (such as John DeMain), librettists (including Gene Scheer), and composers (such as Jake Heggie and Kevin Puts). The annual festival has also allowed the works to be seen and heard by other organizations that are commissioning composers and librettists. While it may not be rare in the symphonic world to play premieres of new works or to get a chance to work with the composer in rehearsals, it is far less common in the opera world. My first experience with AOI was playing in the then-hour-long opera An American Soldier by composer Huang Ruo and librettist David Henry Hwang in 2014. The work is an account of the tragedy of Private Danny Chen during the ongoing war in Afghanistan. Interestingly, the parts in the three-person brass section (which included Senza Sordino Editor Peter de Boor as the hornist) called for doubles on two unusual instruments: the whirly tube and the didgeridoo. To me, they contributed to Huang Ruo’s depiction of fear, uncertainty, and darkness. An American Soldier is one of several works that have seen notable further development and performances. In 2017, it was expanded and received performances at Opera Theater of St. Louis with the St. Louis Symphony Orchestra. Proving Up (2018), by Missy Mazzoli and Royce Vavrek, which tells the story of a family’s quest to achieve the American dream in 1860s Nebraska, was a co-commission with Opera Omaha and has also appeared at the Aspen Music Festival and Columbia University’s Miller Theater. Other works receiving subsequent productions include Christopher Weiss and John de los Santos’s opera Service Provider and Nathan Fletcher and Megan Cohen’s piece Bridge For Three. Several AOI participants have gone on to further achievements. Missy Mazzoli was named the Chicago Symphony Orchestra’s Mead Composer-in-Residence, and has received a commission from the Metropolitan Opera. Composer Nicolas Benavides has been appointed as Glimmerglass Composer-in-Residence, and Rene Orth became a composer-in-residence at Opera Philadelphia. Many have received commissions to create additional new operas. It is our hope that through efforts like AOI, American artists will continue to utilize opera as a way to express themselves and capture the American experience. 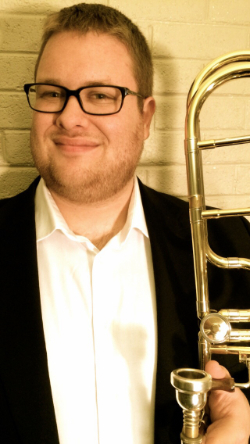 Note: the author is the Assistant Principal Trombone and ICSOM Delegate for the Kennedy Center Opera House Orchestra/Washington National Opera Orchestra.